It is with a lot of sadness that I must advise you that Wyn McAra passed away on March 27th at the age of 94. 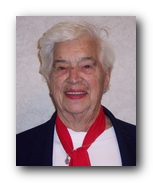 Wyn has served as guiding light in Optimists International for decades, giving of her time and talent to many projects including helping with blind and hard of sight members in the Brailtone Club, and spearheading many public speaking competitions including serving several years as the District Chair for the Communication Contest for the Deaf and Hard of Hearing (CCDHH). Just think of how many kids have been helped by her efforts over the years. Wyn always had a smile and a kind word for her friends, always generous with her time and her talent. She will be remembered as a lady of warmth and grace and a sense of purpose to help make the world a better place for youth. I have been advised by Wyn's family that the funeral services will take place at 11AM, on Saturday Morning April 4th/15 in Highlands United Church 11305 - 64 Street, there will be a light lunch and refreshments downstairs following the service. Please forward this to all who might have known Wyn.